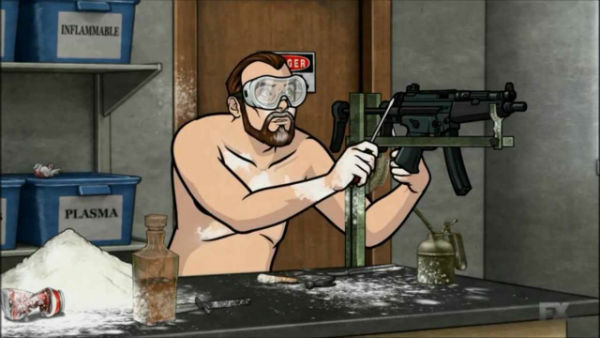 Dr. Algernop Krieger, the one-man R&D department for ISIS on the FX show Archer, is by far the most lovable mad scientist Hitler clone on television. Actor, improviser and puppeteer Matt “Lucky” Yates voices Krieger on the show. And while he doesn’t share his on-screen counterpart’s interests in resurrecting the dead, selling arms to the highest bidder or bickering with his hologram bride, Yates has led a colorful life in his own right. In addition to his work on Archer, Yates recently opened up to us about his work as an additional puppeteer on Adventures of Elmo in Grouchland, the time he almost named himself Sheriff Yates and the year and a half he was married to a local on a Cherokee Indian reservation.